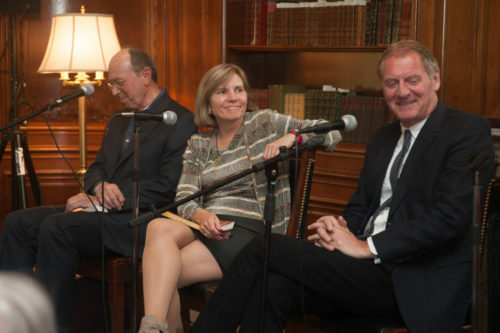 On Thursday, May 11, 2017, The New York Society Library hosted a panel featuring authors Susan Balée, Andrew Motion, William H. Pritchard and Igor Webb, in celebration of the publication of Literary Awakenings: Personal Essays from the Hudson Review, edited by Ronald Koury, the magazine’s Managing Editor since 1985. William H. Pritchard, moderator, first appeared in The Hudson Review in Summer 1967 and became an Advisory Editor of the magazine in 1973. His published criticism includes critical and biographical studies of Robert Frost, Randall Jarrell, Wyndham Lewis, and John Updike. He is the Henry Clay Folger Professor of English, Emeritus, at Amherst College. Susan Balée’s Flannery O’Connor, Literary Prophet of the South (1994) was the first biography of the Southern writer. Andrew Motion, the United Kingdom Poet Laureate 1999–2009, is the Homewood Professor of the Arts in the Writing Seminars program at Johns Hopkins University. He is the author most recently of Coming in to Land: Selected Poems 1975–2015. Igor Webb is the author of Rereading the Nineteenth Century: Studies in the Old Criticism from Austen to Lawrence (2010). He is a Professor and the Director of Creative Writing at Adelphi University.